From the Batman collection by Monogram. 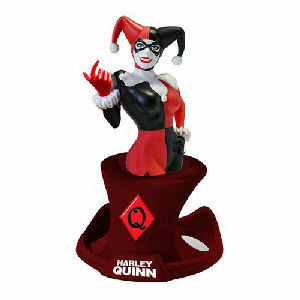 Batman Harley Quinn Bust DC Comics Resin Paperweight. From the Batman collection by Monogram. Batman Harley Quinn Bust DC Comics Resin Paperweight. Measures 5 inches tall by 4 inches long by 3.5 inches wide. Ages 13 and up. Monogram Batman Stationery shipping from Canada. No Surprise Border fees or Customs!